I am house training an adult 3 yr old dog that has been allowed to use pee pads all his life. This handsome mix is a very shy boy and did take a day for me to be able to body handle him without him screaming. He is vetted and in good health, just has no idea where the toilet is. House training a new puppy or an adult rescue dog, uses the same technique, as you are assuming the dog has no idea where to eliminate. While you are conditioning a puppy a new behavior and your are counter conditioning an adult dog a different behavior needs to be considered in your time line for sure. Counter conditioning behaviors will most often take longer. Whenever you are unable to supervise your puppy with 100% attention, you need to place her in either a short-term or long-term confinement area, this is known as management. 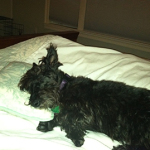 Management is simply a method you use to keep your dog from practicing an unwanted behavior or habit. Your puppy can be placed in a short-term confinement area such as a crate if she will be there for less than her holding limit. The purpose of the crate is to keep her out of trouble while you are unable to supervise her, and to help you house train her. The crate should be just big enough for her to be able to lie down on her side with outstretched limbs, stand up, and turn around easily. It should not be so big that she thinks there is enough space for a bedroom and for a toilet area. When you let her out of her crate you can bring her straight outdoors for a brisk walk and reward her for doing her business in the right place. For longer confinement periods a bigger area, with non-absorbent flooring, such as a bathroom, kitchen, or utility room, is needed. The long-term confinement area should have a bed or open crate at one end, a puppy pad or a strip of sod at the opposite end. 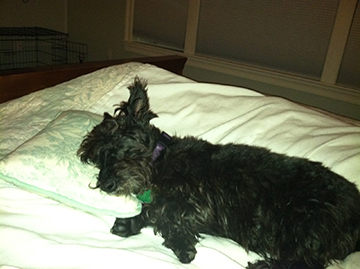 Your puppy will naturally want to eliminate as far as possible from her bed. If the space you use for long-term confinement happens to have a door that leads to the outdoors, then place the toilet area near that door. This way, your puppy’s toilet area is as close as possible to where she should ultimately be heading to do her business. 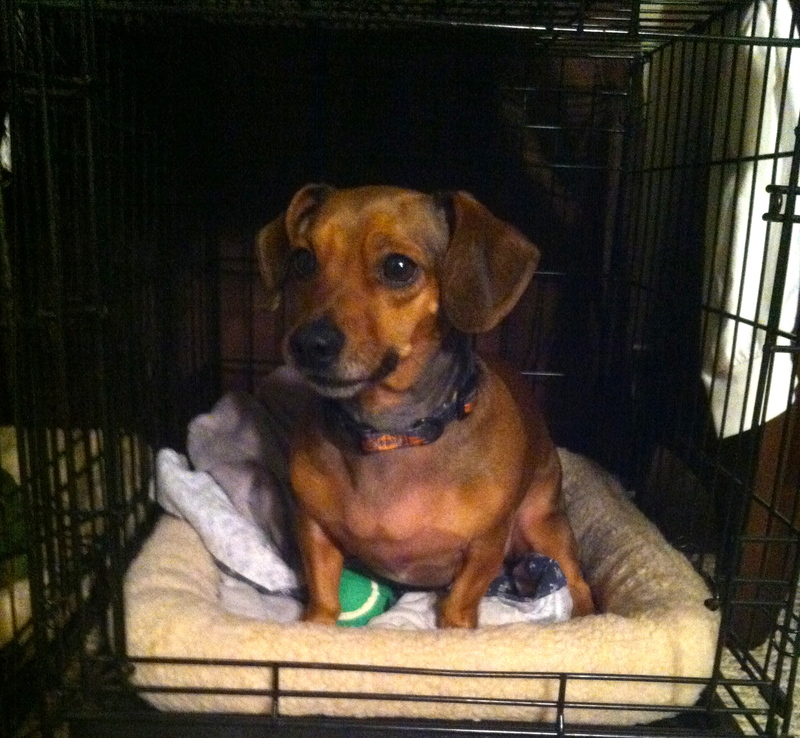 Fresh water and stuffed chew toys should also be plentiful, and should be placed near her bed. Your Puppy will naturally have the urge to eliminate after a nap, a meal, a drink, exercise, excitement, or time spent in confinement. Give your puppy the opportunity to do her business outdoors at these times. When your puppy does her business in the right place offer her a treat, plenty of praise, a game of tug in the house or a walk. After going outside, the pup should be allowed some supervised free time in the house. After an hour of free time, either confine your puppy or using a drag cord with the puppy tied to your hip is a great way to set him up for success and prevent her from having an accident. If you would like your dog to poop promptly when you take her out, then teach your puppy that a prompt poop is her ticket to a walk around the block. This will encourage her to poop as soon as you let her out – and will allow you to leave the stinky poop bag at the house, rather than having to carry it around for much of the walk. If you do the opposite, take her for a walk, and ending her walk as soon as she does do her business, she will learn to delay pooping! 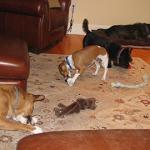 Teach your puppy or new dog that each room of the house is “his” living space as well. 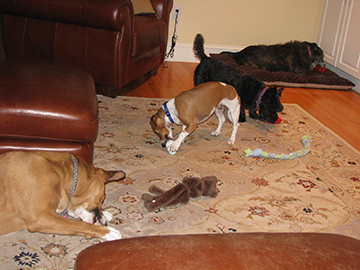 This can be done by feeding, playing and spending time with your dog in each room. Many dogs will assume if they are not allowed in the Living room, that must be the toilet room. When you take your puppy out, always go to the same spot and stand fairly still, this is not playtime, or hunting time, it is time to be quiet and stand still. Once the dog has made a choice to go, yea, then a game can follow! 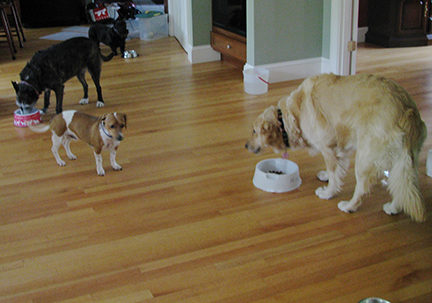 Dogs prefer not to potty in their living space, so help then understand each room is part of their living space too! If you train your puppy to poop while on a leash M-F, then you cannot expect her to poop on Sat. in the back yard off the leash. Our puppies do not always generalize information that well, so if she is having accidents, you must consider her schedule and what you have actually taught her. Have your dog potty at the same times each day, go to the same spot, each day and use the same walking tool such as a 6 or 8 foot leash. Many dogs will not potty with their jacket on, or with their snow boots on, or with their gentle leader on at first. They may need to be taught that it is okay to do so. Remember, dogs prefer to avoid conflict, so they will avoid getting in to trouble even if that means avoiding going potty near a human. Keeps puppy safe when you can not watch your puppy. Teaches puppy to keep his area clean. Should be used as a safe haven for your pet. Begin when you first bring your puppy home. Start with just a short time and increase the time as your puppy feels comfortable. Do lure your puppy in and out with treats so he enters on his own. Avoid shoving your puppy in and shut the door right away. Keep the crate in a place where your puppy can hear you talk to him. If you wait more than a few seconds after your puppy has eliminated before expressing your disapproval, your puppy will not know why she is being punished. If you catch your puppy about to pee or poop in the wrong place you can clap your hands and say “Ah-ah”, and swiftly take her up to the outdoors to continue. Punishing her after the fact just makes her anxious for you to return the next time as she will assume you will be aggressive every time you come home. Honestly, I have met many dogs who refuse to potty when their owner is on the other end of the leash. Why? We know dogs learn through associations, so if even one time, the owner yells and swats the puppy on the nose or body for going potty in front of him, the dog learns “never potty when this human is near.” So, be patient and reward your dog when he does go in the correct place, use management to set him up for success and always train your dog in a positive way so he learn to trust you and become a companion rather than a flight risk. Enjoy the journey, bumps and all! Fight or Flight Response in Dogs? It is easier to understand human intentions. On a recent trip, I found myself in a nice hotel lobby visiting friends. I decided it was time for “goodbyes” so I headed for the elevator. When the door opened, there were three rather imposing-looking men standing along the back wall. I froze for a second! Do I get in and turn my back to them? Do I step in and continue to face them? Do I walk away as if I forgot something? At only 5’1″ I often feel vulnerable when alone, but knowing I was in a nice hotel, I chose to step into the elevator, turn slightly sideways and push the appropriate button. As the doors closed I felt an intense hot flash rush over my entire body. Feeling trapped with no flight path, I was over come with fear. I decided I would fight if needed and looked into the nearest mans face and said “Hi.” He smiled and nodded his head. I looked at the young man in the middle and he nodded before I could speak and looked quickly away at the ground. I looked straight at the third man and his head was resting on the back wall with his eyes closed. With this information, I did not feel as threatened and was able to relax just a bit, although I was still on guard as the elevator took FOREVER to get to the 10th floor. I waited until the door began to open and then quickly stepped out of the door in a sideways movement and looked behind me to see if anyone would follow. Thankfully the doors closed and I was free to hustle to my room. The feeling of being safe was oh so good! Am I clear? says the golden. Good, I don’t want to bite you. We think of prey animals such as the horse, deer and other animals with wide set eyes to use flight as their way of staying safe. Predators such as wolves, cats & dogs will often choose flight if given the opportunity. However, if a valued resource is worth fighting for, or if a predator is trapped and prevented from flight, then it will likely use a fight response to keep himself safe. Fight-or-flight responses are as normal in our canine friends as in our human friends. When you see a dog use a fight response such as a growl with a specific stimulus, consider if the dog has a good reason to do so. Is the dog trapped? Is this dog given a chance to use flight? Could this dog have good reason to not trust a particular stimuli? Back off, I am in fight mode as there is no flight accessible. I suggest if you have a dog that is using a fight behavior, consider first the dogs history. Assess the situations, observe the dogs entire body, seek to understand before you consider how to proceed. Do not immediately correct or punish, as this dog may have good reason to growl or snap. The dog may simply be afraid. Help me prevent dogs from being punished for choosing fight when they are left with no other option. Dogs that have been punished for simply being afraid, are much harder to counter-condition later. Dogs will bark if they feel threatened. They may bark when they play and get excited. Some dogs will bark for attention from us or another dog. Some will bark if they are in pain and they’ll even bark when they’re lonely, bored or stressed. Certain breeds or breed types are also genetically inclined to bark more than others. How you’ll prevent or resolve your issue with barking will partially depend on what is triggering your dog to bark. For example if your dog is barking or vocalizing because he’s in pain, treating the source of his pain would be the obvious solution. If your dog is barking through the front window as dogs pass by your house, blocking off access to that window is a simple way to help prevent his barking. Keep in mind that the more your dog practices barking the better he’ll get at it. So identifying what is triggering your dog to bark and if possible, removing the trigger or changing the emotions that cause your dog to bark are best. For Example, if your dog barks each day he hears the mail truck, take your dog out side and reward you dog with a yummy treat for looking at the truck, after a few days of this classical conditioning, take your dog out and reward him for looking at you or any other behavior they offer before they bark. Eventually, your dog will learn to simply look at the mail truck and watch it go by with no worries at all. In my opinion, antibark collars which use shock are inhumane and are inappropriate for all kinds of barking problems (and often make the problem worse). 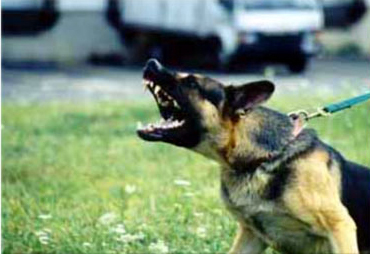 Many dogs that have been shocked for barking at a mail man or garbage truck have ended up trying to bite this stimuli which causes them pain each time it is near. With the right kind of behavior modification and a strong desire to stop the problem, most pet parents can successfully resolve barking issues using classical conditioning methods. The Alert Barker does so to alert you to someone or something outside, the answer is quite simple. Remove the source of what triggers his barking. For instance if your dog barks at people as they walk past your home, prevent his access to the window using furniture, closing blinds, blocking off the area with a baby gate. Remember, if your dog barks and the person or dog moves away, this is very rewarding for the dog and will certainly be repeated. The Lonely Barker is often more simple to modify, try changing your dog’s environment a bit. Remember that your dog probably wants to be with people. Dogs who are left outside for long periods of time are often the worst offenders of barking. Your dog needs to play with you and feel like he is a part of the family. Dogs typically don’t do well when left alone for long periods of time. 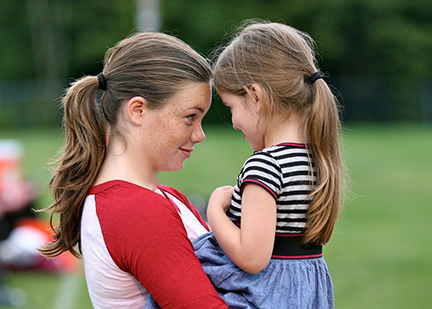 Make sure you set aside time for regular walks, playtime – even some training sessions. You’ll want to be sure that you give him the social contact that he needs to keep his body and mind occupied. Barking when left alone may also indicate separation anxiety. 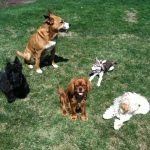 If you think that anxiety is the source of your dog’s barking, contact a certified dog trainer. Attention Barking may be a dog that barked and you tossed him a toy, you have just taught your dog, “When I bark you play!” Even if you look at him or verbally scold your dog when he barks, you will still be teaching him that his barking is a successful way to get your attention. What can you do? You need to ignore his demands. His barking may initially increase and so don’t give in or he will learn that persistence pays off. However, if he barks and you really ignore him or even better if you ignore him and walk away until he is quiet, he will eventually learn that barking doesn’t work and it will decrease. Our dogs are not trying to dominate us, they simply do a behavior and if something follows that they like then they will repeat the behavior. Dogs are smarter than we think, so be carful and watch what you are rewarding! This handsome boy is a character, as he loves all dogs! He adjusted to my home very quickly showing no fear about the new environment. He is very friendly with all my dogs, is crate trained, comes when called and rubs on you like a cat. 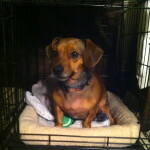 He is sleeping in his crate and is happiest if he can see one of my dogs. He has met 9 new dogs since I have had him and loves them all! Walks well with a harness, did great with his bath and really loved the towel rubbing. He needs to be reminded where to potty, but other than that he is a joy! Let me know if you are interested in meeting this handsome little boy!